L.A. County Sheriff Lee Baca speaks at a news conference this morning. Photo by Luiz Inzunza/Metro. 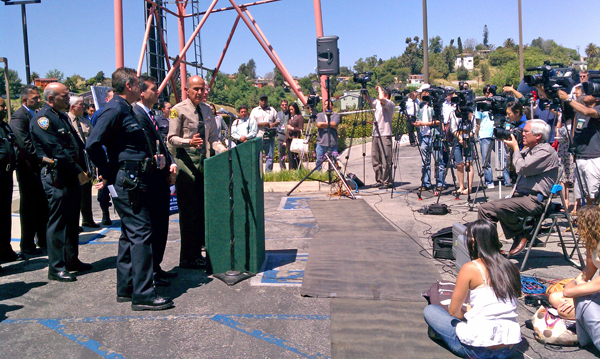 Los Angeles County Sheriff Lee Baca, flanked local elected officials and law enforcement partners, said that while there are no specific threats against high-profile targets in Los Angeles, the public are the “eyes and ears” to remain vigilant and are encouraged to call (877) A-THREAT or visit iWatchLA.org to report suspicious activity. “Transit systems throughout the world have been attacked by extremists who are extraordinarily determined to disrupt the lives of people,” Baca said. Since 9-11, a Threat Interdiction Unit, K-9 deployment and installation of closed-circuit televisions on all the mass transit operations have been effective in keeping riders safe, said Sheriff Captain Holly Perez of the Transit Services Bureau. “But our biggest asset along the buses and rail lines are our public”, Perez said. • Strangers asking questions about security or building security procedures. • Briefcase, suitcase, backpack, or package left behind. • Cars or trucks left in No Parking zones in front of important buildings. • Intruders in secure areas where they are not supposed to be. • Chemical smells or fumes that worry you. Any activity that seems out of place can be reported to the nearest Sheriff deputy at Metro rail stations, or to Metro staff by pushing the emergency intercom in rail stations or rail cars. The public can also call 1(877) A-THREAT or file an online report at www.iwatchla.org.